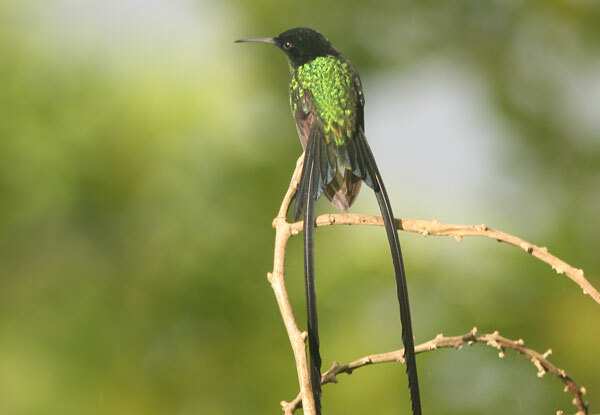 The Black-billed Streamertail (Trochilus scitulus) is a Jamaican endemic, either conspecific or closely related to its more common cousin, the Red-billed Streamertail (Trochilus polytmus). 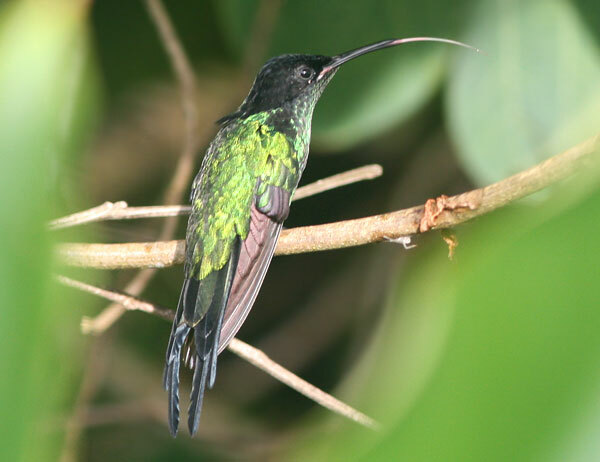 While the red-billed variety is easily found throughout Jamaica, the black-bill is restricted to the eastern corner of the island. Some call this bird the swallow tail while others dub it streamer-tail, swallow-streamer, or scissors-tail. Obviously, those ribbon-like retrices, which far exceed the male bird’s body in length, make an impression! The independent mobility of the streamers is also pretty cool. 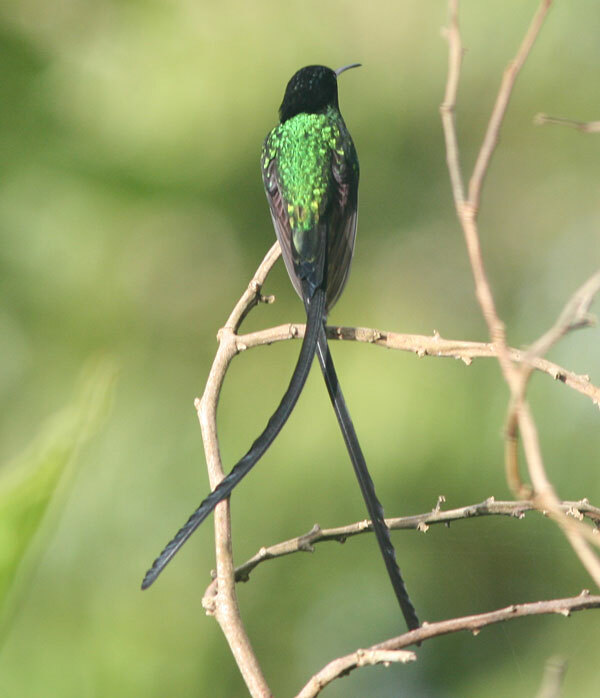 The Black-billed Streamertail stands as one of the most special species to see in one of the most special spots in the Caribbean. It’s safe to say that no hummingbird lover’s list is complete without it. Sensational bird. 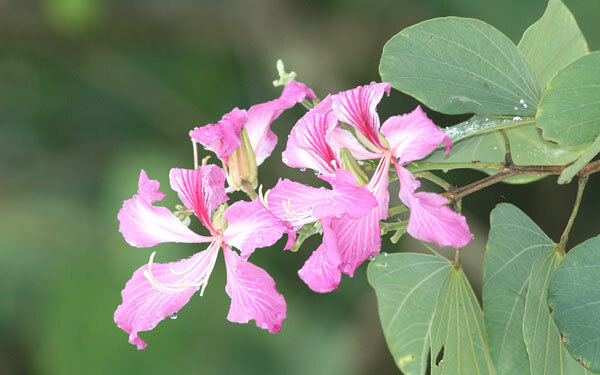 I think the flower might be an Orchid Tree. Mike, just … you know ? … yeah, you DO know! I’ve only ever seen Ruby-throateds. Not complaining, not whinging, just mentioning. The last picture must be the coolest and most unusual I’ve ever seen of a hummer. Thanks, all. I wasn’t certain that last photo would be appreciated but, considering the aesthetic astuteness of our audience, I shouldn’t have worried! Thanks for the ID, Ricardo. I think Jamaica has got it figured out. With the Doctor Bird as the national bird, I get jealous with my country’s blundering, stealing, Bald Eagle! The Doctor Bird is nothing to be jealous about… the Bald Eagle is so regal. I think we in the New World are so lucky to have hummingbirds. I am watching the Oscars right now and I want to nominate the last image for “Best Picture”…. and seconds? Hi. I was researching a birding trip for myself to Jamaica this year and saw your site. 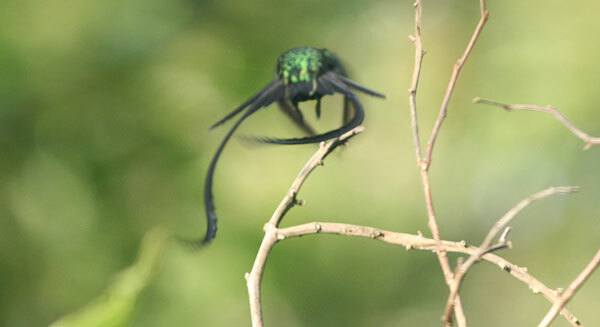 The streamertail photos were fantastic and the info helped me out with where to go on Jamaica. Thanks very much. Hi, Joyous. Thanks for the ID. I didn’t realize this tree was an exotic. Do the seed pods of the Monkey Puzzle Vine look like little melons? I saw a vine with exploding melons in Guatemala but was fortunately spared from the barrage of seeds. 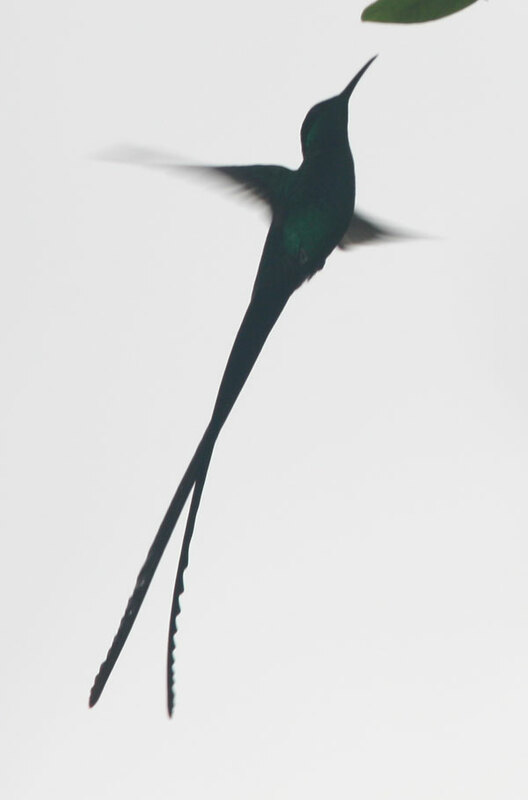 Your silhouette of the Black-billed is stunning. I am very interested in using the photo (with permission if need be) as the theme and cover page of my NonFictional novel; this abstract can reflect me a book character. This is an amazing bird that is truly unique. Beautiful Shots.This was also an interesting article in regard to the name .